This book commemorates a place and a time in American law teaching, but more importantly, an outlook: the common law tradition. That outlook was empirical and tolerant. These values were carried into expression by a group of people who were not part of a cult or faction nor ruled by the herd instinct. Now in paperback, The Common Law Tradition is a collective portrait of five scholars who epitomize the tradition.The focus is Chicago in the 1960s. 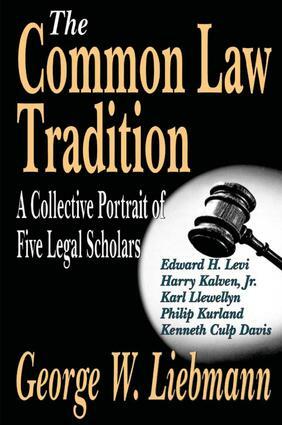 The five figures considered--Edward H. Levi, Harry Kalven, Jr., Karl Llewellyn, Philip Kurland, and Kenneth Culp Davis--did much to broaden the perspectives of the legal academy. Levi made use of sociology, economics, and comparative law. Kalven collaborated with sociologists on the Jury Project and with economists on tax law and auto compensation plans. Llewellyn's commitment to empirical research underpinned his work on the Uniform Commercial Code. Kurland's approach to constitutional law was highlighted by his insistence on the relevance of legal history. Davis was an energetic comparativist in his work on administrative law. What distinguished these Chicagoans is that their work was practical and rooted in the law, and hence yielded concrete applications. The group's diversity, the tolerant atmosphere in which they taught and wrote, and the attachment of its individual members to empirical approaches differentiate them from today's legal scholars and make their ideas of continuing importance.